I would like to share my own review of this ball. The Short Review: Wow, wow, wow, wow!!! I am a low rev, low ball speed, Full Roller. I have zero tilt and a 90 degree axis rotation. I have tried a lot of balls over the years and never really found one that perfectly suited my style. Because of the way I roll the ball, I have been kinda stuck in the middle of where I want to be. Balls that provide the control that I need usually do not have carry power for me and ones that have the carry power usually do not provide control. As a result my average stays about the same, in the 170’s. I have always thought the early and heavy rolling Gas Mask core would be the perfect core for a urethane ball. In my opinion and the opinion of others, urethane is about early roll and hook set. Many modern urethane balls have very high RGs and low Diffs, the opposite of the way I think a urethane ball should be designed. But when I heard that Hammer was finally putting the Gas Mask core in a urethane ball, it was like my wish had come true. I purchased the Black Widow Urethane and had it drilled to maximize its abilities. I used the Aggressive Full Roller layout with balance hole for Asymmetric cores. I have attached a photo of the layout on my ball. I tested the Widow at Kearny Mesa Bowl which uses Brunswick Pro Anvilane surface and the Big Ben oil pattern. Basically a pretty slippery surface that historically for me never allows any urethane ball to be used as none have the traction necessary to grip through that heavy volume. Only one urethane ball has ever been able to roll on these lanes for me and that is Visionary’s Midnight Scorcher Particle Urethane ball. Of course the Scorcher will hook in any volume of oil, but I mention it only because I did not expect the Widow Urethane to have a hope on these lanes. I tried to get lined up with the Widow and was surprised right off that it actually was getting into a roll. After some experimentation I finally settled with right foot on 12 ½ targeting 9 ½ at the arrows. This allowed the Widow to ride the oil line half in and out. I then rolled my first game. The result was stunning. I could not believe my eyes. The Widow simply could not overreact and yet it hit like a runaway train! I was able to simply roll the ball and it would hold the line and then gently arc into the pins and crush them like no ball I have ever used before. I had two open frames but still rolled a 221! Remember I am a 170 average bowler and 200 games are rare for me. 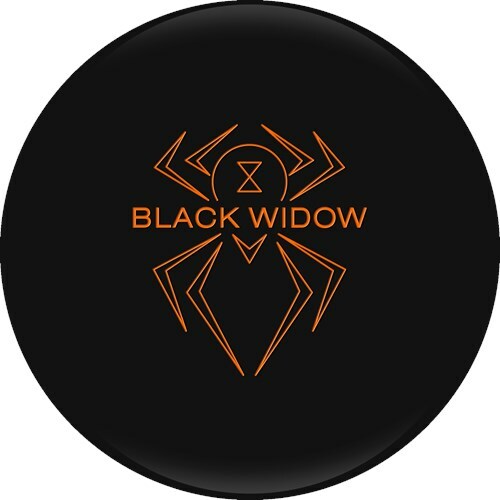 The Black Widow Urethane is about full control of the target line. For me it was magical, truly magical. I could just play down and in and the ball would go exactly where I rolled it with not even a hint of over/under or late overreaction messing my shot up. Had I finally found the ball that was made for me? It seemed that way. If I made a bad shot then the ball did exactly what I expected. But here is the amazing part, this urethane ball gave me margin for error. I could miss right a couple of boards and be ok and miss inside a board or two and be ok. So I essentially had a 5 board target area with a urethane ball! If I missed right the ball would hook and set and crush the pocket high flush. If I missed inside the ball would sit and hit high flush and crush the rack. If I hit a tad light the six pin snapped the 10 out every single time. If I hit real light all the pins were thrown at the 7 pin and once again a strike. Only really, really bad shots left trouble. The other remarkable thing I could not believe was the oil handling ability of this ball. These lanes were flooded this day and the Widow was soaked to the bone with oil, slick and black. Yet, it did not blunt the power or reaction of the ball. It kept hitting for 5 straight games and I never moved a millimeter from my target line or with my feet. Finally I got exhausted from practice and left on a real high. You know that high I speak of, the high that comes from bowling at a new level. That is how the Black Widow Urethane made me feel. It made me a better bowler, it taught me how to be smooth and roll the ball and be rewarded for accuracy. The following Monday I took the Widow to my doubles league at Parkway bowl. They put down less volume than Kearny and do not have the Pro Anvilane surface, so I was worried the Widow would be too strong. But in warm up I stood in the same place with the same target I had used at Kearny and guess what? Same exact reaction! During play it was clear the magic I experienced in practice at Kearny was still working on the Parkway house shot. The result of that night was a new high series for me, a 630! Remember I am a 170 average bowler, yet that night I rolled a 221, a 189 and a 225. On the final 225 game I opened in both the 9th and 10th frames due to missing spares. And once again I did not have to move a millimeter through the whole set with either feet or target. The Widow flares a ton (even for a low rev bowler like myself) as you can see from the attached photo showing the flare lines during my doubles session at Parkway. So that is my real long review of the Hammer Black Widow Urethane ball which I believe is a ball that should be put on a pedestal and worshiped, it is that good. It is so powerful and controlled. It is the most amazing ball I have ever used. I still can’t understand how this ball does what it does. Below is a link to the video of my review session with my new Black Widow Urethane. Your.layout is different then mine, and your average is a little higher then mine. Bit my first impression of the ball was similar. I wanted something stronger then the ebonite wear wolf Plastic ball I been using the last almost 3 months. Like you I have a slower speed or revs and I found over the last year I was not getting what I wanted from the reactive Resin. Not that I wasn't bowling well with that old plastic ball of mine 548 2 weeks ago with a 213 to finish the series. But I wanted something stronger then plastic at least for the first 2 games.even though I can work that plastic ball well enough to Make my buddy with a much higher average then me. Have several WTF? Moments I can tell the plastic ball will not carry as well if my timing is off just a little Or I miss my target half a board or less left of my intended target. Anyway so far anyway the blackwidow urathane appears to be doing what I hoped it would for me. All I can say Is WOW!! Best Urethane made to date!!! It comes with the Legendary Gas Mask core wrapped around Hammer’s 100% Urethane. This ball has great midlane read with a lot of hook for urethane. I have been able to throw this a large number of patterns and it always performs GREAT!! This is a must to have in anyones tournament bag, I found this to pick up the mids early than OG Black Hammer and have about 2-3 more boards of Hook than OG Purple urethane.